The Community Affairs Office provides public relations, marketing and communications including production of published material for the City of Ridgeland. If your organization is hosting a community event in Ridgeland, you may notify the Community Relations Specialist for inclusion in the online Events Calendar. This office serves as staff liaison for the Community Awareness Committee. For more information, contact Kristen Beal at 601-856-7113, ext. 2052 or kristen.beal@ridgelandms.org. This is a city publication that is released quarterly by the first of the following months: December, March, June and September. The aim of Ridgeland Life is to help build a sense of community among residents, to share information about city and community news and events, and to reveal the high quality of life available here to visitors and newcomers. The publication is free to the public. Recreation and Parks programs and event sponsors benefit from ads within the publication and their logo on the back cover. RECRE8 is included in every issue for its details about city recreational programs, special events and parks/facility information. Contents typically include city meeting schedule, phone numbers for city departments and elected officials, upcoming events, city news, local school information, Ridgeland Public Library programs, and Ridgeland Chamber of Commerce events and news. Deadlines for submissions are 6 weeks prior to release date. Sign up to receive email newsletters and email news blasts from the City of Ridgeland. These monthly and periodic emails feature city news, meeting schedules, and upcoming city and community events. If you have community news to share, email kristen.beal@ridgelandms.org,the community relations specialist. 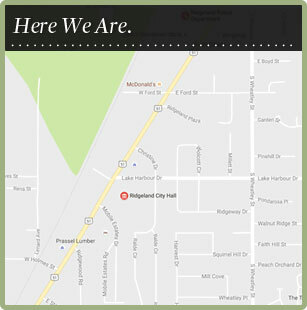 The Community Affairs Office regularly produces press releases and photos pertaining to City of Ridgeland news. These are posted on the website under News. Reprints of news articles may also be shared in the same location. The City of Ridgeland posts regularly to several forms of social media, including Facebook, Twitter, Instagram, and LinkedIn. You may connect with us on these platforms by clicking on the affiliated icons on the front page of our website. Established by ordinance in 2004 , the City of Ridgeland Community Awareness Committee is charged with serving as a conduit of information to and from the Mayor and Board of Aldermen and to help establish long-range goals and projects for Ridgeland. The Committee is instructed to involve more citizens in community life, to raise opportunities for volunteerism and to build open communications for community decisions and projects. Monthly meetings are held on the fourth Monday at 5:30 p.m. in the City Hall Board Room. Committee members are appointed by the Mayor, each Alderman, the City of Ridgeland Chamber of Commerce, and three representatives are nominated by the committee and submitted to the Board of Aldermen for approval.